Pollination of lupin: Can we make meat-replacements even more sustainable? Thanks to Ekoplaza we reached our target and we can improve our project. Improve further by donating! Some Dutch producers are trying to use locally produced lupin as the basis for the production of meat-replacements. By using lupin instead of imported soy, the ecological footprint of meat-replacements can be greatly reduced! Unfortunately, the yield in the Netherlands is rather unpredictable and variable in quality, where the lack of the right pollinators for lupin can play an important role. How does pollination of lupin take place? Flowers of plants have been evolving for millions of years to design the shape, colour and size of the flowers in such a way that they attract the right pollinators for cross-pollination of the plants. An ingenious system makes sure that lupin is pollinated properly: the weight of a pollinator pushes the petals of the flowers downwards, revealing the stamen and pushing the pollen on the belly of the pollinator and hereby making sure that the pollen gets to the next flower (see also the video). Because of this, lupin is depending on the right pollinator, mostly bumblebees, which are heavy enough to push down the petals. However, honeybees are placed in the crop fields to ensure pollination. In contrast to bumblebees, honeybees are too light to fully push down the petals. Because of this the yield is unpredictable and the quality is variable, hampering the food production. My name is Thijs Fijen and I would like to study how the cultivation of lupin, the Dutch ‘soy’ can be made more profitable and sustainable by specifically studying the role of bumblebees. A major motive in my work is that I really like to look for opportunities to combine sustainable food production and conservation of biodiversity. 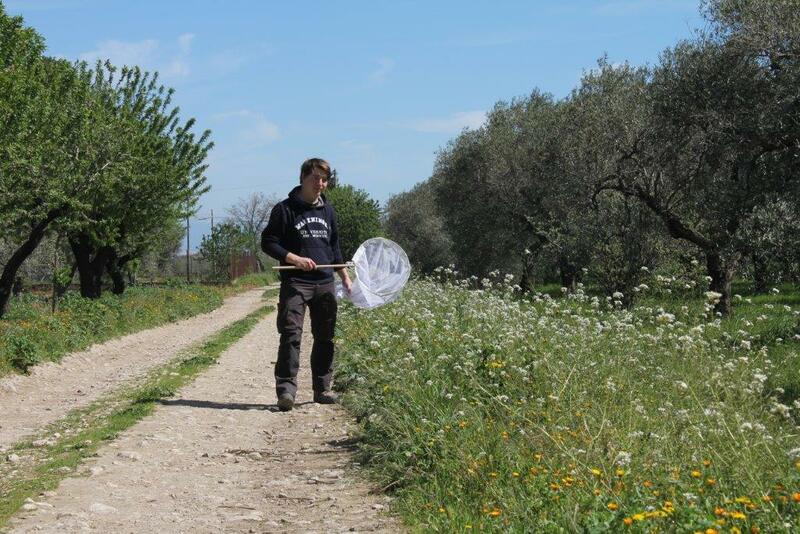 I am paying a lot of attention in this in my doctoral research, and recently I was awarded the ‘Zilveren Parnassia’, a prestigious award for talented young researches in nature conservation. This project is particularly exciting for me: important pollinators of lupin are bumblebees, amongst the extinct large garden bumblebee (Bombus ruderatus), which might profit from an increased lupin surface. When we can grow more, and better quality lupin, both farmers and bumblebees can benefit. A real win-win situation! Me in action in Italy! Here we monitor where the crop pollinators are before crop flowering, so that we can better protect and manage these areas. Ok, but what do you want to do? As a first step, I want to show that the pollination by bumblebees indeed increases the yield and quality of lupin. I want to do this for as many lupin varieties as possible, so that this research may readily be used in the selection of better varieties. At the same time we then show the importance of promoting and conserving bumblebees around arable fields! By supporting this project, you will help establishing sustainable lupin production and conservation of bumblebees, so join me! Last week a sponsor let me know that he wants to double each and every donation, including the ones already donated. This is incredible! We now have more than 60% of the budget! Thanks for your support, really appreciated! You will support the renting of the field site for our experiment. We kindly invite you to the 'open day' at the experiment, and we send you a bag of seeds of the 'best variety'. Thank you so much. You will receive a postcard with a cartoon about bees! Great! With this donation you sponsor one plant in the experiment! You will receive a postcard with a cartoon about bees! Great! With this you support the watering and nurturing of the experimental plants. As a thank you, you will receive a bag of the best lupin seeds. Thank you for your support! You are sponsoring the purchase of the bacteria that lupin needs for getting extra nitrogen. We kindly invite you to the 'open day' at the experiment. Great! You make it possible to use one extra lupin variety in the experiment! You'll receive a special cooking book on cooking with lupin! We also kindly invite you to the 'open day' at the experiment, and we send you a bag of seeds of the 'best variety'. Great! You make it possible to use two extra lupin varieties in the experiment! You'll receive a special cooking book on cooking with lupin! We also kindly invite you to the 'open day' at the experiment, and we send you a bag of seeds of the 'best variety'. Thanks so much! You make it possible to do the field work in the experiment. You'll get a personal Meet&Greet with Thijs Fijen, or he can give a seminar on location! Wow, great! You make it possible to analyse all the results of the study! Much appreciated. You'll get a Meet&Greet with Thijs Fijen and Professor David Kleijn, or they can give a seminar on location!